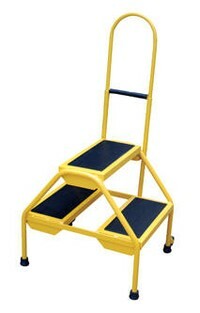 Mobile two-step design for access to hard-to-reach places. Tublar steel construction. Two styles to chose from - rubber matting or perforated steel steps. Top step height is 20" and measures 16" wide (15 3/4" usable) by 8" deep. 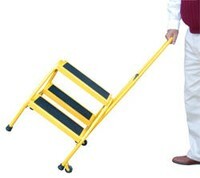 Two rigid wheels allow for easy tilt and roll portability. Ships knocked-down for lower shipping costs. Powder coat finish.